© 2019 Progress Career Planning Institute. All rights reserved. 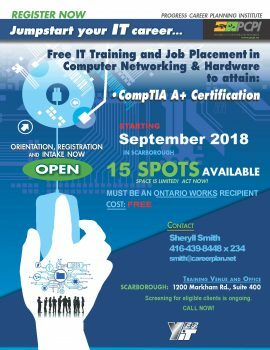 Progress Career Planning institute(PCPI) is offering the CompTIA A+ certification program in our Scarborough location. This industry recognized certification will be offered over a 14 week period. Best of all this program is FREE of charge to the participants who qualify!!!! The primary qualification for this program is; the candidate must be an Ontario Works recipient. Please let us know at PCPI if you are interested or if you know someone who qualifies and this program would suit them. Below is the flyer including all the contact details.